Prof. Dr. Theppanom Muangman, a Harvard graduate and Thai doctor famous for his research on aliens, is giving NASA a run for their money after his video talking to a Thai “alien medium” with a female voice on his iPhone went viral last week. 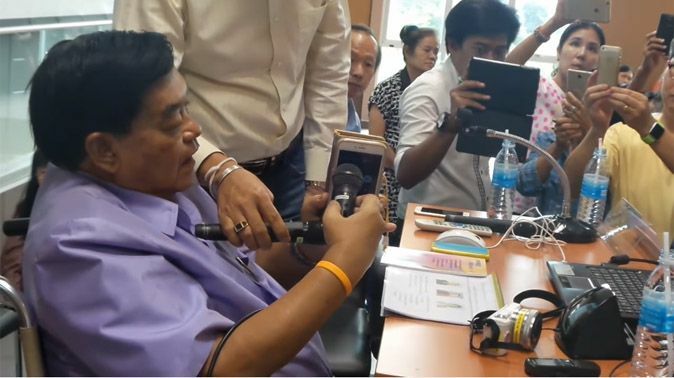 The 80 year-old and former dean of the Faculty of Public Health at Mahidol University, claims his request for Martian ships to land outside a room where he was conducting a seminar was granted. “I’ll let whoever doesn’t believe it speak with you. Sir, please talk in Martian language,” Theppanom said as put his iPhone on speaker for the audience to hear. ““kari%mg#f@! Only the superb among all men can sense aliens… Not for long, humanity will face grave catastrophe. It is unavoidable,” the female medium translated as she switched between Martian and Thai languages. “In the future, there will not be many humans left. Only those with pure minds can live,” she said. So, when will this happen? the professor asked. How are the politics and economics? When will they get better? You’re not being very specific, Martians. Before his audience could tire of the call, Theppanom decided to step up the stakes and told the Martians to land their UFOs outside the seminar room, as the group flocked to the windows with their mobile phones. While no one could see anything, some said they could “sense their presence”, Coconuts Bangkok reported. The extraterrestrial phone call was part of a seminar held in mid-December by the Mind Science Institute in Bangkok. Some more facts about Prof. Dr. Theppanom Muangman. * He became widely known in Thailand when he claimed he captured a UFO in 1994 in Kanchanaburi province. * He’s currently the director of his own Mind Research Association. Next Next post: Vacancy for Filipino English Teachers in Phitsanulok soon!